Over 35-years of industry-relevant experience! Independent office products and equipment resellers must embrace digital strategies. Access our FREE knowledge base to learn everything you need to know about the office supplies, office products, and business equipment industry, and how the transformative impact of the internet affects the way businesses operate today. Many of the independent resellers in the United States have been around for decades and have well-established business relationships in their local communities. However, as the world goes digital, old-school relationships are no longer enough and dealers must re-structure for the digital world. Office Products & Equipment Resellers face significant challenges as the market shrinks, consolidates, and as they struggle with their digital transformations. 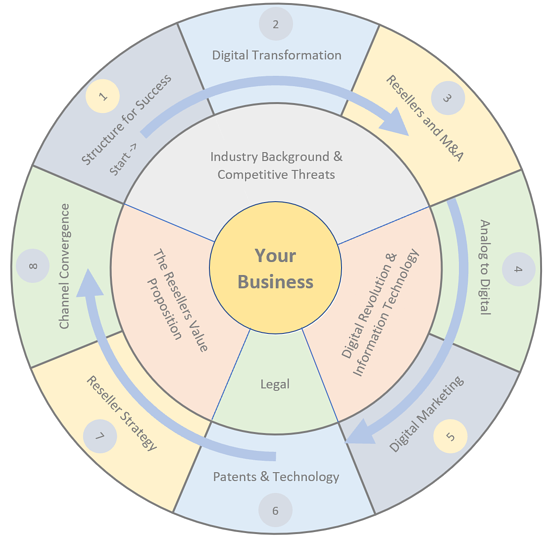 Learn more from our comprehensive paper evaluating all the components necessary for a successful digital transformation strategy. The office products and equipment industry is a mature industry with mergers and acquisitions taking place that threaten the future of independent resellers. Learn more about this activity, how to take advantage of it, and what strategies can turn it into a twenty-billion-dollar growth opportunity. Resellers in the office products and equipment vertical mostly lack the skills to convert from an analog to digital presence. However, with it becoming increasingly difficult to imagine successful businesses without a strong digital presence, developing the skills necessary for digital transformation has become critical. Sending an email is easy so many do but, effective email marketing requires a major effort and for those that aren't prepared to make that effort, the results will be poor. Learn more about each of the required elements for effective email marketing that underpin successful brand development. Generic printer cartridges can be an important tactic for resellers to use for increasing market share. However, the OEM's depend on post-equipment sales for as much as 75% of their lifetime value and 99% of the profits. Learn more about the legal landscape surrounding aftermarket cartridges. Independent resellers in the office products and business equipment verticals face a desperate case of catch-22. Most lack the know-how or financial resources to set the foundation for a digital business transformation that, the absence of, is destined to lead directly to their ultimate failure. There's a great divide between the office products and equipment channels with the A3 copier business model versus the A4 desktop printer business model forming the barrier between the two. However, as print volumes decline the need for expensive A3 copier devices also declines and A4 equipment, with a lower cost of ownership, is poised to take over and turn the legacy business model on its head.